Do you like Salmon??? If so, then this is an appetizer you will like. It’s been awhile but… Today’s post isn’t really so much about a recipe as as all of the prepared foods are already found on the blog. Instead, it’s more of about a presentation that’s super easy to do is fun and fill of flavor. How can you miss with this? I wish I could take credit for this recipe but I can’t. It came about one Saturday afternoon while Baby Lady and I were watching Hubert Keller, Secrets of a Chef, Gravlax In Three Easy Steps. 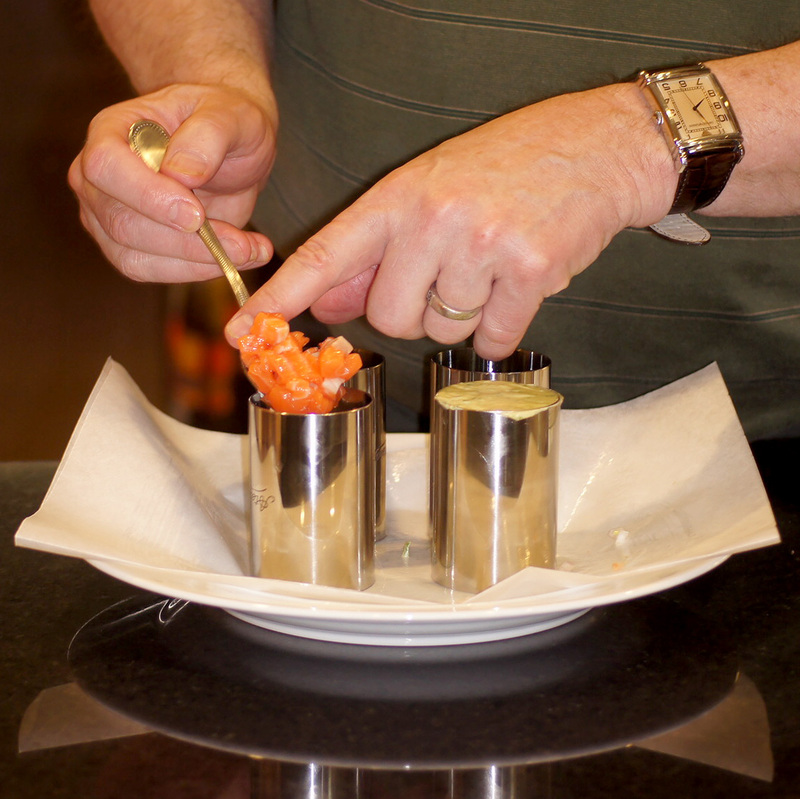 This episode was about salmon: Classic Salmon; Salmon Tartare; and Salmon Stacks. 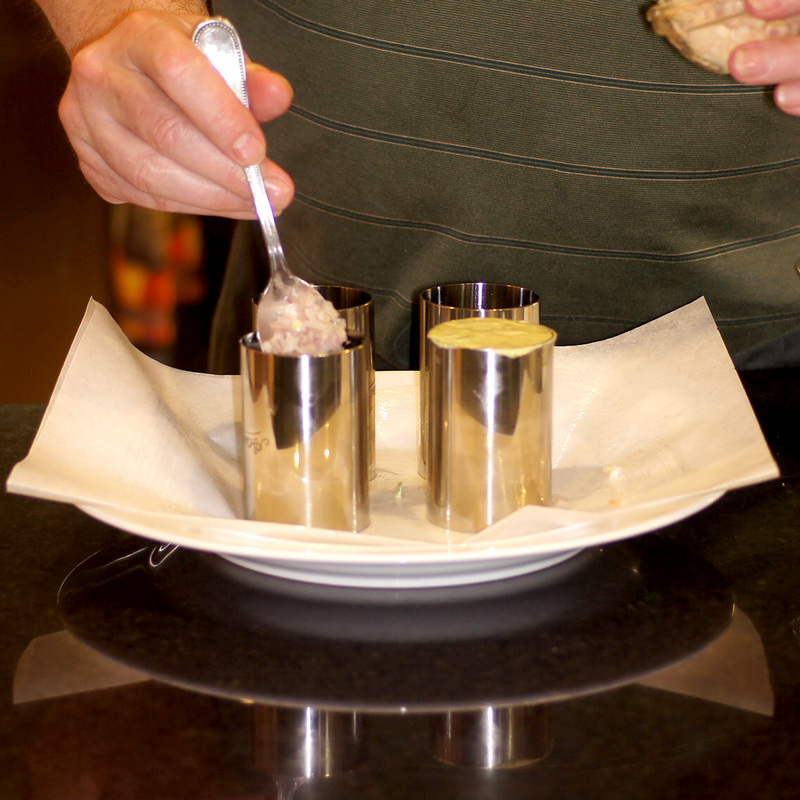 Now, we like Hubert Keller. I especially like his classical training, his technique and his approach to food in general. 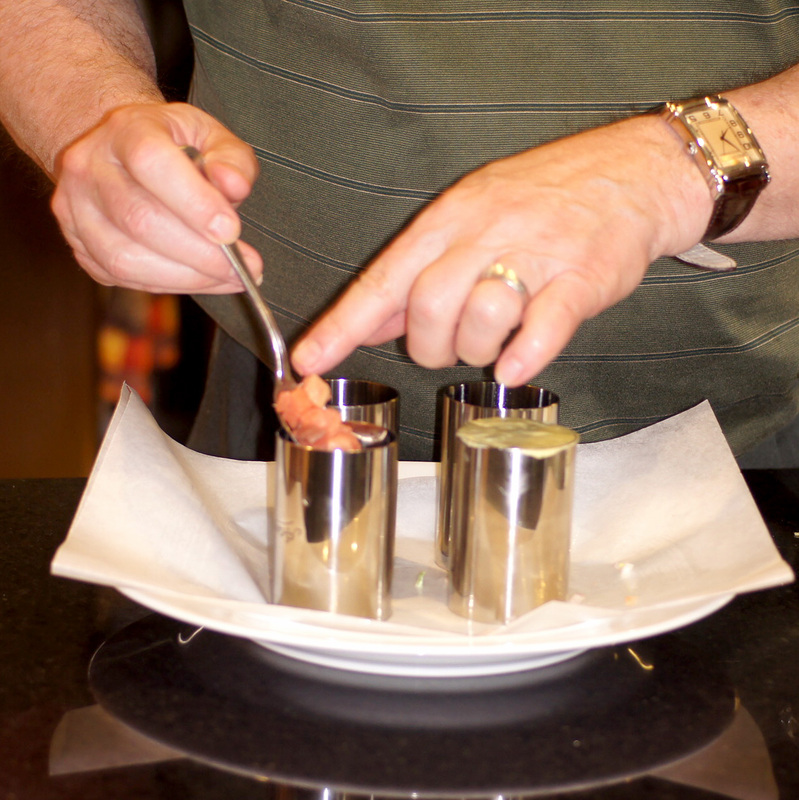 In this episode I was especially looking forward to his spin on gravlax and the salmon tartare. 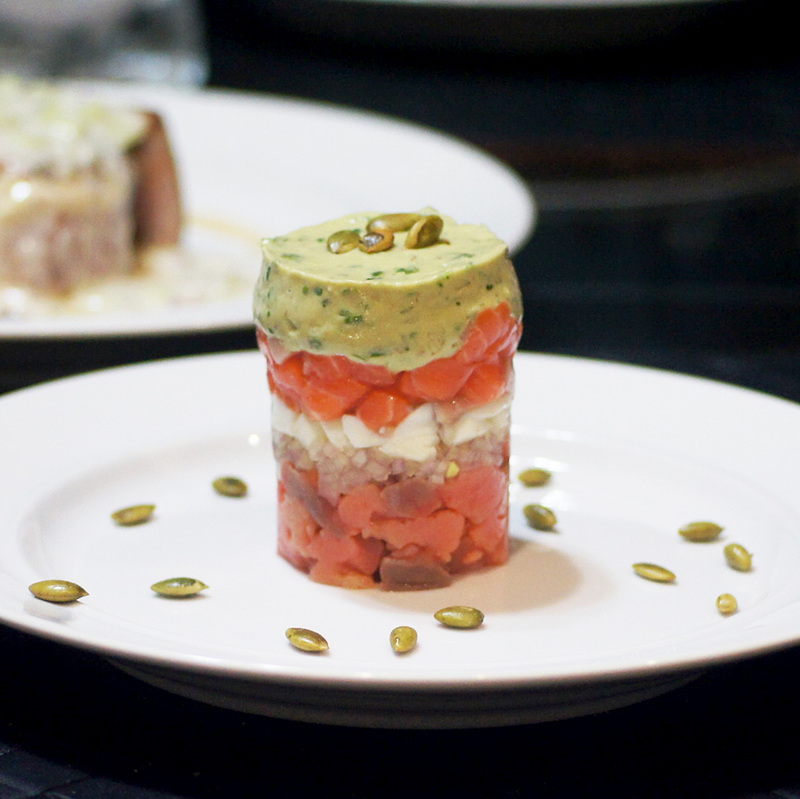 This episode, however, didn’t seem to hit on all cylinders and both recipes seemed “off.” Nonetheless, I liked his innovative approach of including gravlax and salmon in a tartare. So, we decided to take his idea without his recipe for the gravlax and avocado and use ours instead. The result was stellar and this is what we did. 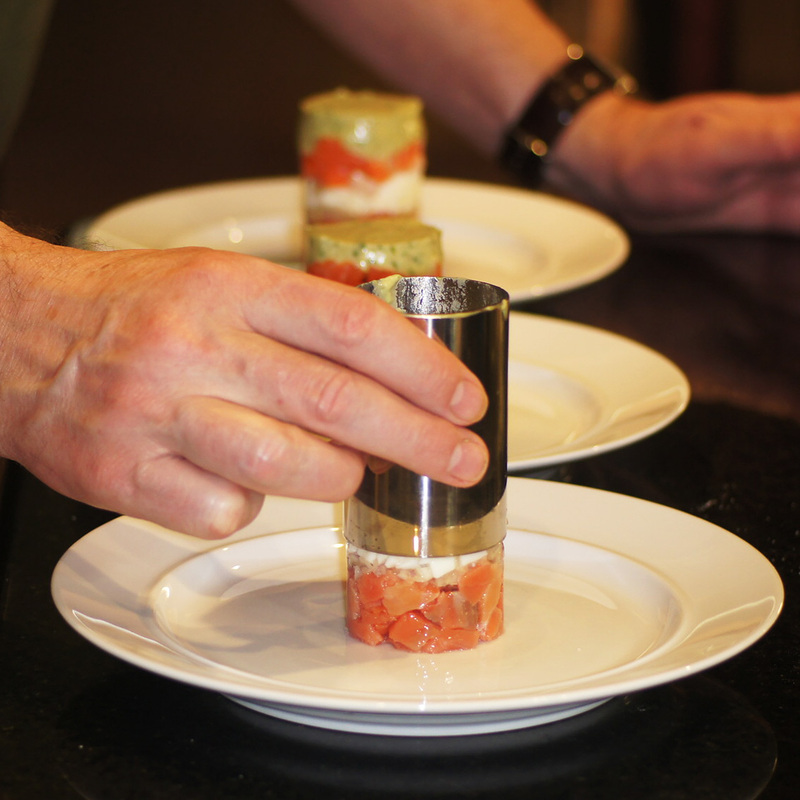 Add minced gravlax to form the base of the tower. 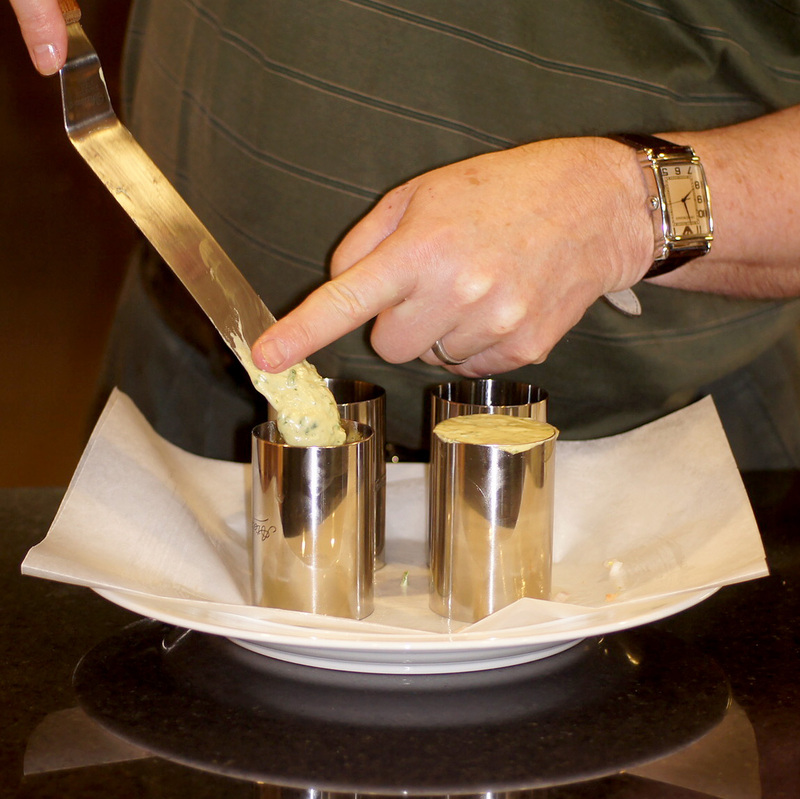 Finish with the avocado cream. 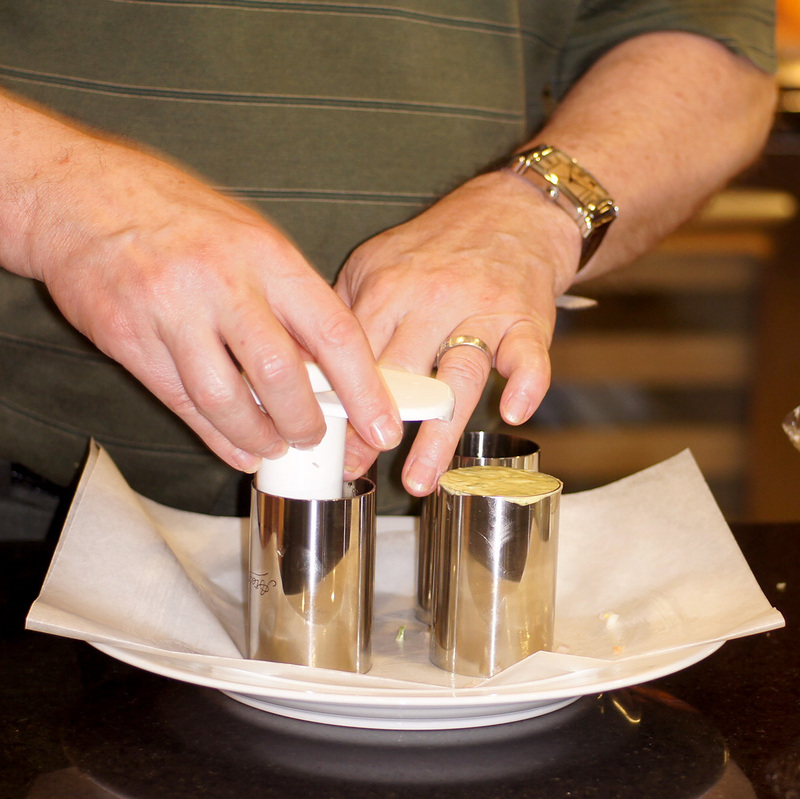 It helps to apply the cream with an offset spatula as you will need to smooth the top. 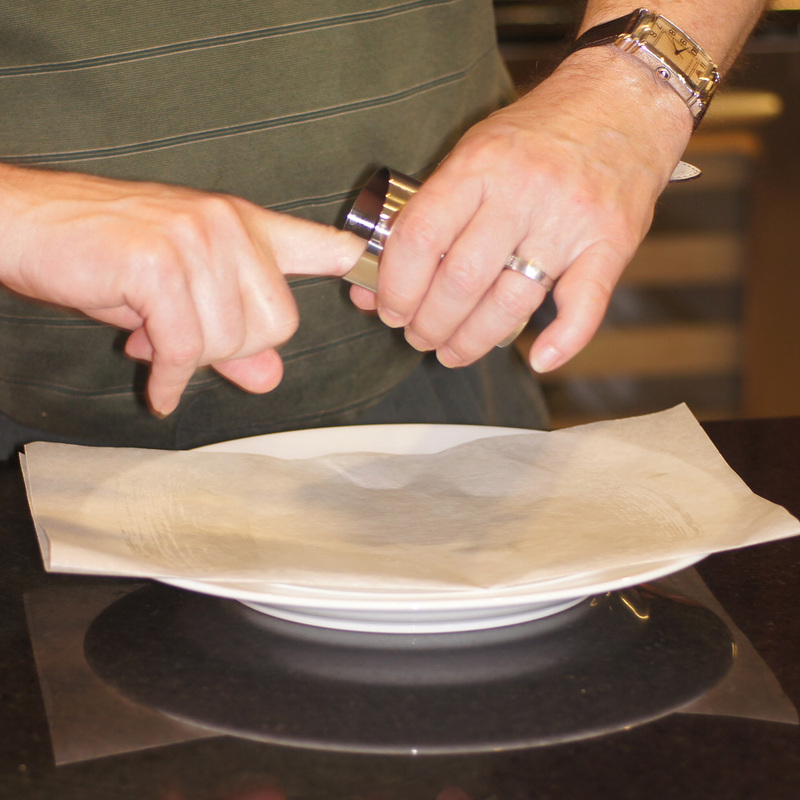 Using the offset spatula, place the ring mold on a plate. Because you oiled the ring mold, the tower will slide out very easily. See??? Good to see you out there in the blogosphere Richard. Your towers looks too good and a bit tricky to eat! Almost too pretty to destroy eating it. I just never think to use my molds I finally invested int. Must do this soon. This sounds delicious! What a beautiful presentation! I could eat this for a light dinner with come crusty bread !!! Oh my goodness, what a beautiful and delicious way to use salmon! Well done, Richard! Fabulous! 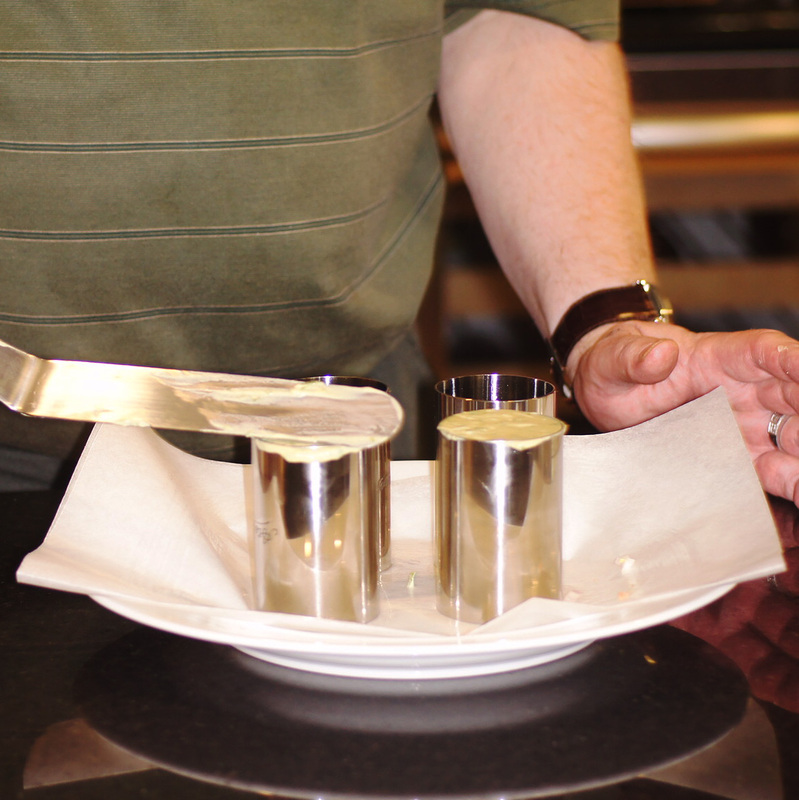 I love all aspects of that appetizer, and the presentation is gorgeous! I love salmon. How beautiful! Great to see you back. These are particularly elegant and delicious looking. I could see mine (if I tried them) falling over between island and table. Great job. Thanks Conor. 🙂 It’s good to post when I get the chance. Right now there is so much happening and so little time. 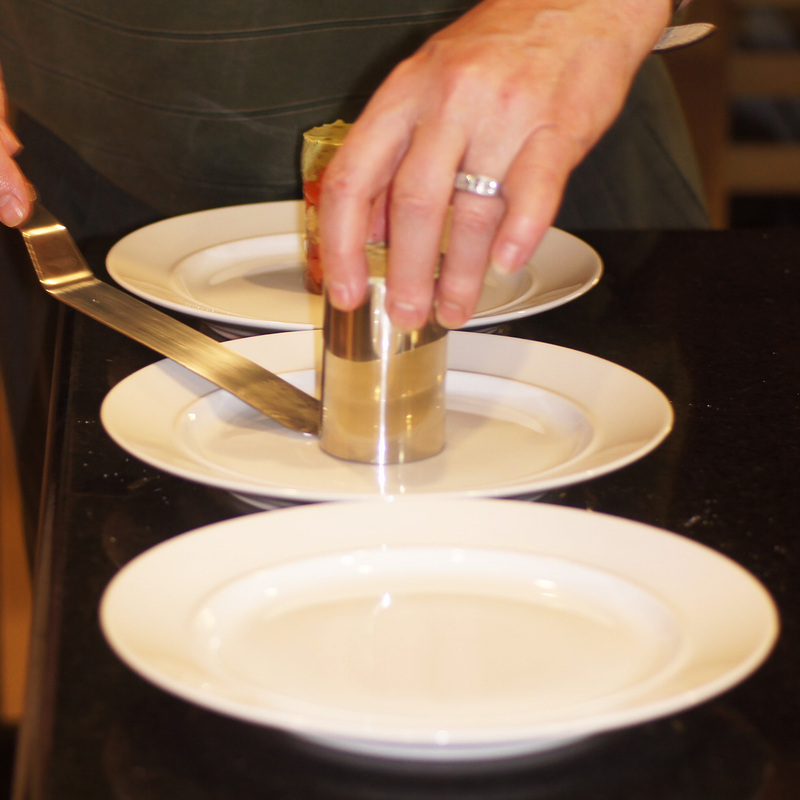 I have several posts (including one of your dishes) pending and will get them up into blogshpere eventually. As for falling over, the tower is remarkably stable and that’s not the real problem. 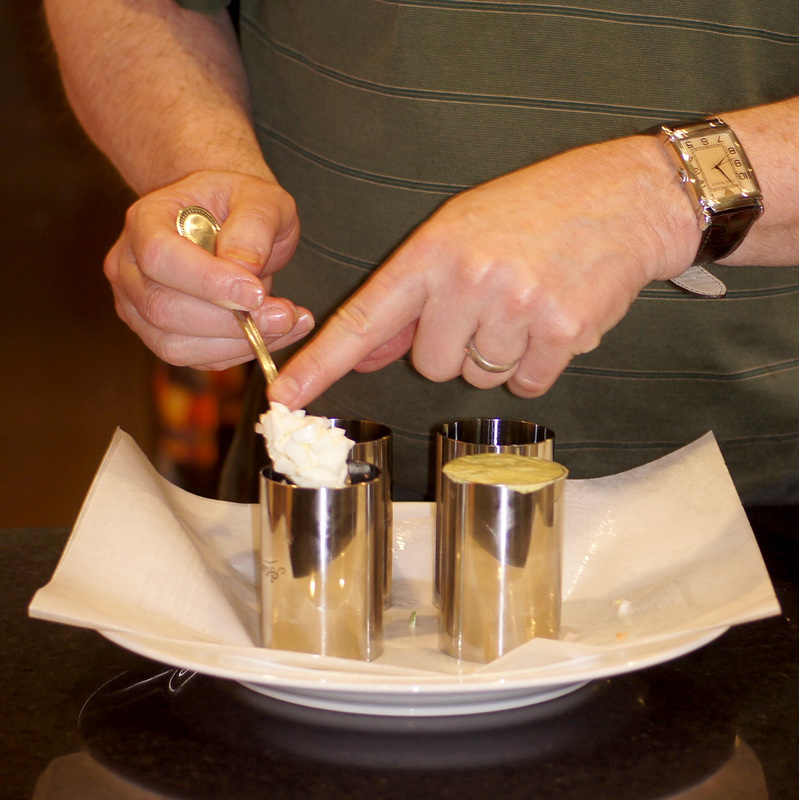 The plating photo shows the avocado cream was beginning to run down from the top. 😮 It’s a trial and error thing on getting it the right consistency. The flavor, however, is unbelievable. Looking forward to them. I have a few sous vides lined up. I am punctuating them with regular stuff to prevent accusation of “forgetting my humble roots”. This looks great, Richard, and I’m sure it tastes great as well. I’ve bought some acetate foil to play with, which could make it easier to remove the ring mold without destroying the shape. Looking forward to your next posts! Hi Stefan. Thanks for the nice compliment. I look forward to seeing what you do with the acetate tape. Lovely presentation but I would expect nothing less. Nice to see you out in the blog world, you are missed. Thanks Karen. You are always very sweet. How is the construction on the new home coming?? Thank YOU, Richard. 🙂 Trim is up and they have painted the walls. Next week they start the tile. I think it should be finished around the first of May.